This 13kg gas pizza oven has everything you will need to create tasty, home-cooked pizza in your own garden. 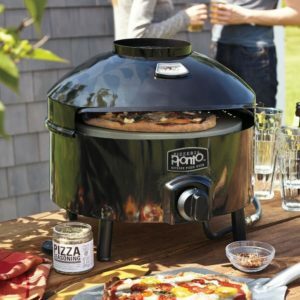 Designed to be used with a liquid propane tank, this portable and compact outdoor pizza oven with in-built pizza stone, thermometer and gas hose is the perfect budget solution to making your own homemade pizza and crunchy calzones, without the cost of building a brick outdoor pizza oven yourself. The ideal gift for a pizza lover! This black gas pizza oven is delivered throughout the UK and has an enamel-coated steel body that is designed to trap and insulate heat, so energy is used efficiently. The dual-layer cordierite pizza stone allows heat to diffuse throughout to give an even bake. This oven heats up to optimum pizza-cooking temperature in 10 minutes or less, so should you feel a sudden impulse for authentic baked pizza, you can make it in no time at all. Hosting a pizza party? This gas-fuelled oven from Pizzacraft promises to cook a 14” pizza perfectly in just 5 minutes – that’s 12 pizzas per hour. Expect to be a hit at your next BBQ or garden party! With a 20lb tank of propane, you can expect your Pronto Outdoor Pizza Oven to last approximately 25 hours. A great additional purchase to the Pronto Outdoor Pizza Oven is the pizza oven leg extension kit, to give you more versatility in height. While it cooks standard pizzas beautifully, it sometimes struggles to roast vegetables really well, so if you like your pizza covered in layers of veggies, you may want something more powerful. 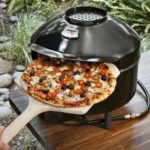 This outdoor gas pizza oven cooks up to 14” pizzas, which is plenty large enough for the average person, although it would be improved if it was just a little bigger. It’s a good idea to also get yourself a wooden peel for turning and retrieving the pizzas, as they tend to stick less than a metal peel. You may also want to consider a wind cover and pizza stone brush for ease of cleaning and storage. If you want a reasonably priced solution to cooking quick and tasty authentic pizzas in the comfort of your own home or garden, then this Pronto gas pizza oven burner is not a bad choice at all. It’s simple to assemble and manoeuvre, quick to heat up and cooks pizzas well. It’s not the fanciest or most rustic pizza oven out there, but for the price, we think this is a great option well suited to a family holiday or BBQ.